Post-colonialist criticism has won my favour today, because I’ve been revising all the theories that I haven’t written about in my essays. This presents a problem, because I didn’t realise at the beginning of the year that I couldn’t write about the same topic twice. This means I’m in the slightly tricky position of having to write about all the theories that quite frankly, well, I’m mediocre (at best) at. This means that a frantic revision of all the compulsory reading ensued, and now I’m feeling marginally calmer, I’ve had an epiphany: I will not have to write about Jacques Derrida under exam conditions. Anyone familiar with Derrida’s work will realise what a completely beautiful blessing this is. Anyway, I’ve been reading extensively around the subject of post-colonialist criticism today, which essentially considers the nature of literature in terms of its understanding of ‘the subaltern’, and how Britain perceives the world, whilst it perches on something of a pedestal due to its great imperial past. It was certainly a great past, if slightly ethically questionable. Some would argue that because our empire has disintegrated, that we are no longer great, and instead ride on the coat-tails of the reasonably new superpower, the United States of America. But that’s a whole other conversation. I like the idea of the subaltern; the idea that we cannot communicate with the subaltern, as proposed by Edward Said is interesting, because it suggests we have no way of creating a common language with which to communicate. Structuralist theory, as dictated by Ferdinand Saussure, suggests that in order to communicate, we must have a culturally agreed code to fall back on, to determine the meaning of the sign. (In this case, words). Without this shared culture, it is seemingly impossible to communicate quite literally, across the world. Jane Austen’s Mansfield Park is one of the best examples of literature that is concerned with empire. She discusses the role of Sir Thomas Bertram in Antigua, running a slave plantation. She personally was opposed to slavery, however in the novel, it is implicitly accepted as a commodity that is fundamental to the wealth of the Bertrams. Interestingly, when the financial difficulties of the plantation become apparent, no lifestyle changes occur, almost as if to suggest there is an innate wealth underpinning the lifestyles of the family. Post-colonial critics have suggested any number of things about Jane Austen in relation to this novel, such as the idea that she supports slavery because of the nature of the Bertrams wealth. An interesting counter to this argument however is that Fanny Price, the novel’s protagonist, asks her uncle, Sir Thomas about the plantation, and he neglects to give a reply. This could be interpreted as showing an awareness of immorality, and therefore an unwillingness to discuss the situation with his niece. Returning to the ideology itself however, I find it extremely compelling because of its entanglement with history, perhaps more so than other forms of literary criticism. The key critics behind post-colonialism, including Spivak and Said, present repeatedly reputable arguments that discuss the British attitudes towards empire, and towards this culture that we are unable to communicate with, due to our extreme cultural differences, and historic hegemony towards them. For anyone with a particular interest in the British Empire, I’d suggest reading Orientalism by Edward Said; it presents some very interesting forward thinking on the subject of empire and dominance, and for anyone unfamiliar with the concept of hegemony, I’d suggest looking that up too. Antonio’s Gramsci’s marxist thoughts on hegemony provide a very interesting inside into the ways of imperialism in the modern world, a world that has long moved on from naval conquests, into a more political kind of empiricism. Eighteenth century English satire is perhaps one of the most sophisticated of the literary periods. It subtlety satirizes, or makes ridiculous, the institutions that existed at the time, including the government, the treatment of children, and indeed social structures themselves. 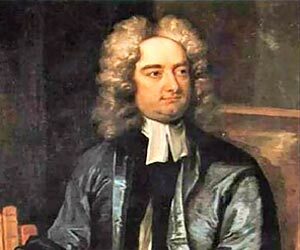 Jonathan Swift and Alexander Pope were both famed satirists in their way, respectively Juvenalian and Horatian in style. Jane Austen was also a satirical writer, writing a critique of the restraints of the upper and lower classes, in an often amusing fashion. A Modest Proposal for Preventing the Children of Poor People in Ireland From Being a Burden on Their Parents or Country, and for Making Them Beneficial to the Publick, commonly referred to as A Modest Proposal, was written by Jonathon Swift in 1729, at the height of satirical importance in English literature. Swift was a famed satirist, however his complete body of works does not sit comfortable in either a Juvenalian or Horatian category of satirical writing specifically. This particular work however is broadly considered to be a Juvenalian text, combating issues of morality, such as the man’s treatment of his wife with ridiculous sentiments such as her usefulness as a “breeder”. It is this incredibly powerful juxtaposition that provokes the mind to consider these sentiments in all seriousness. Juvenalian satire is an angry, biting form of satire, using morality to create a situation in which contempt can be provoked. In A Modest Proposal there are certainly a number of these elements, such as his extreme derision towards himself as a narrator, and the continued references to human children as delicious meats for the wealthy, products of a “breeder”. Whilst it is strikingly obvious that this is a satirical condemnation of the poverty and lack of government awareness in Ireland at the time, Swift himself may have to a certain extent supported these ideas. There are however, also elements of Horatian satire in the pamphlet; Horatian satire is a gentler form of derision that is motivated more towards amusing the audience, as opposed to repulsing them. There are very few elements of his kind of satire in this text; for instance, the suggestion that the cannibalistic behaviour would lead to a more loving marital situation is astounding, especially since it suggests that men would view their wives in the same way as they view their livestock. Swift himself attempted to protect the oppressed in Ireland, specifically those who lived under the control of the English (often absentee) landowners, and the Irish Parliament, which was dominated by English influences. Despite being an Anglo-Protestant himself, and being elected Dean of St. Patrick’s Church very reluctantly, he sought to protect the Irish against the Anglo-Protestant classes, using very serious sermons to spread a message. Most significantly however, Swift went to the power of the pen, and wrote pamphlets such as A Modest Proposal that highlighted the issues of poverty in such a severe way that it was impossible to ignore such an extreme mode of communication. Swift had huge psychological problems with being connected by blood to Ireland, and appears to have had a very complex psychological stance on identity and society as a whole. Nevertheless, he sought to speak out against the huge issues of poverty that he saw in the streets on a daily basis. These problems included infanticide, begging, and prostitution. Due to his position as a senior member of the church, Swift often experienced these issues first hand. For those who haven’t yet started to look at satire, then I’d say that you should if only for the entertainment value; without considering the social implications, the satirical texts tend to be amusing on a superficial level. That surely is the point of satire; to amuse, whilst causing somewhere, in the subconscious, a consideration of the meaning of the text. We never have been able to fully understand the subconscious; and in the same way that we don’t understand fully how dreams are formed, we don’t understand what makes us think of ideas in the way that we do. A testament to the power of satire is how it has continued to be a significant genre even today, especially in television. Satire is fundamentally amusing, and often hides the more serious implications of satire for society within its fabric. It is not an overstatement to say that Virginia Woolf and I have had a somewhat turbulent relationship; from adoration, to despair, to overriding hatred, and then finally a return to understanding and adoration. It has however, been rather one-sided. Over the years, from the beginning of my A-levels to the present day, I have been bound to read a variety of Virginia Woolf’s works; To the Lighthouse, Orlando, A Room of One’s Own… and so forth. It was very rare that I picked up Woolf of my own freewill (in fact, I’m not sure it has ever happened… ) because I found her fiction somewhat challenging, and as I found with Jane Austen, I thought that nothing really happened. Nothing of any note, at least. Nothing quite as gripping as a Robert Ludlum thriller; I felt it was all rather dry, focussing on the tiniest possible events in the upper middle class, bourgeois world in which she lived. As tends to happen however, I changed my mind. To begin with, I was fascinated by To the Lighthouse, because whilst I found the prose itself beautiful, I deemed the novel a nemesis of mine; the unclear narrative, and the stream of consciousness technique has never been a particular favourite, largely because I am of the opinion that stream of consciousness has its platform, for instance in dreams, and in speech; however not written on a page, without any external context. I found it simply too dense, too difficult to relate to; it challenges all the boundaries of everything that was literature before the technique, and it is similar to linguistic doodling; pretty, perhaps; even beautiful, but nevertheless, without any coherent structure, and lacking in refinement. Orlando however was far more structured, however as tends to be the case with Virginia Woolf, some kind of boundary had to be pushed; in this case, it was the idea of gender. In the novel, the protagonist changes gender from a man to a woman, quite literally overnight; fundamentally however, she remains essentially the same in terms of person. I personally enjoyed Orlando, especially since it also includes a trip through the ages, over the course of Orlando’s life, from the Elizabethan Age to the 20th century. The protagonist is less a description of a person as opposed to a description of a persona; a symbolic representation of the fluidity of the concept of gender. For further information, Judith Butler’s essay on “Performative Acts and Gender Constitution” is fascinating. And so by the end of 2009, I was firmly against Virginia Woolf, and was seriously considering building a time machine so that I could have gone back, changed her mind about being an author, and subsequently saved myself the agony that was that particular essay. Fortunately this somewhat childish plan changed when I had to read A Room of One’s Own. For the first time, in any of Woolf’s writings, I found her engaging, even charming. The content of the essay was delicate; it suited the theme of feminism extremely well. As a result, I became a full-time lover of Virginia Woolf, abandoning the turbulence of our previous relationship. An astonishing element of literature, and of one’s relationship with the author, is the fact that one work can open one’s eyes to the others; providing almost a key of understanding, and a different perspective. This of course questions Roland Barthes assertion that the author is dead; when a person forms their own perception of the author, and understands their background, education and ideas, this can open up the text to the reader. It can exist in its own right, however it can also be inaccessible in this way, and so understanding a biography is just one of the ways in which a text can be understood. Overall then, I’ve fallen for Virginia Woolf. I’m feeling tempted to go back and revisit To the Lighthouse, to see if I appreciate the techniques a little more this time around; I suspect that everything could be understood with a little perseverance and the right sort of teaching. Everything except calculus, that is. Heathcliff, I Love You. Best, Cathy. I may have mentioned on here before that I absolutely adore Wuthering Heights. As clichéd though it may be, it is one of my favourite novels of all time; not least because it represents the beginning of a darker, more emotional age of literature. Emily Bronte also represents the true beginning of the prominence of female writing, despite publishing under a pseudonym. She succeeded Jane Austen as a writer, however was at least in my opinion, the first truly revolutionary writer; the themes of Wuthering Heights were described as psychologically disturbing by critics of the age, especially because of the almost animalistic nature of Cathy and Heathcliff’s relationship, and the haunting, omnipotent style of their dependence on one another. This is I think the most enchanting element of the novel; the essence of it being that nothing could stand in the way of their devotion to one another, regardless of the demands of the social hierarchy that they both existed in. Marriages and children seem to have little or no impact on the connection they had between themselves, and set within the Gothic Yorkshire landscape, the ghosts that seem to envelope the novel, and create a dark, moody atmosphere, become a trademark and allow anyone who wishes to, become a part of the novel. The Yorkshire countryside plays a very significant part in the novel, purely because it is widely regarded as being a sparse, cold space which is uninhabitable by many. The regional accent of Joseph, demonstrated phonetically in the novel adds a large degree of regional identity, something that modern novels particularly seem to lack, especially when considered alongside the phenomena of social networking; we all inhabit each other’s linguistic space and therefore the regional difference and being able to visit a region with no understanding of the linguistic culture is extremely rare. At this point, we can consider that Cathy is in herself an institution; she represents emotionally powerful women everywhere and she is not necessarily a victim of Heathcliff’s emotional attachment to her. The idea that she was not financially dependant on Heathcliff, was almost unheard of at the time. Her financial dependence on Edgar Linton is a completely separate dependence from that which she has on Heathcliff. What is extremely interesting is that the relationship between Cathy and Heathcliff is never really defined; the reader never really discovers if they did in fact consummate their relationship, or whether their relationship is based around that of the childhood sweetheart. The indefinable relationship that exists between the two of them is perhaps what makes the characters of the novel so important in this particular instance; the reader is allowed to make up his or her own mind about the nature of their relationship. This unsolvable mystery can be pondered by critics, however will, I think, be open to individual interpretation across the board. The novel has been remade on several occasions both in film and in song; Kate Bush famously made a song named “Wuthering Heights”, and ITV have recently made a two-part drama adaptation which is fantastic, even if it is not accurate in terms of the text itself. The number of remakes, and the influence the novel has had on concepts of romantic love, shows the innate power of the novel to reshape and subvert our expectations of a 19th century relationship. It also represents how the novel has become an intrinsic part of popular culture, whether it is explicit or not. Overall then, I think those who have yet to read the novel should go ahead and do it; if only to broaden their minds regarding 19th century literature. I did once believe that 19th century literature was simply dry social commentary, with very little action and even less depth. However I believe Wuthering Heights transcends our expectations of the 19th century novel and brings to life themes which are not immediately associated with a rural female writer. For a long time now, I’ve hailed Jane Austen as my least favourite author. Having suffered through Pride and Prejudice at GCSE and despising every second of it, I couldn’t bring myself to suffer through Sense and Sensibility. However now, I’m compelled to read Mansfield Park in preparation for next term, and so snuggled up in bed with a pot of tea, I braced myself for yet another sitting room drama and social commentary. And was extremely pleasantly surprised. I’ve always found the endless social details of Jane Austen nothing but intolerable, but when I began this novel, I was slowly brought around to the idea that I may actually enjoy Jane Austen. 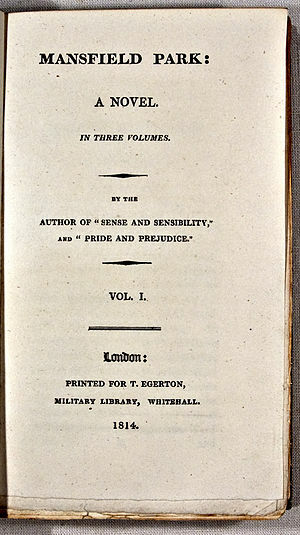 The story of Fanny Price departs from the diatribe that is (at least in my opinion) Pride and Prejudice and begins to explore themes a little wider than marriage, and the roles of women; she begins to look at adultery and themes of friendship. The humility of Fanny is endearing to any reader, and unlike Pride and Prejudice, there seems to be a little more in the way of progression and action, which as a reader, I find crucial. In much the same way as I find Much Ado About Nothing intolerable, I like a novel to have an engaging and interesting plot, if only so that I can enjoy it on a superficial level, and to give some enjoyment to the physical act of reading. There is nothing worse than having to struggle with a novel, reducing it to being an unendurable experience. Fundamentally, reading should be a positive act, something to entrance the mind instead of repelling it. By making literature inaccessible to everyone say a selected few, the author strangles his industry. That is not to say that Jane Austen is inaccessible however; only in my personal opinion, at least she was, up until now. Whilst I haven’t quite finished the novel quite yet, I feel as though I’m going to enjoy it. I may become fascinated with her as both a person and a writer, and I think that after this novel, I will try to tackle Emma. Suggestions here are welcome! I think my plan for the evening involves a small drink with my flat mates, an episode of Blackadder, and then an evening of Mansfield Park. What more could I ask for?